In March of 1889, a new auditorium opened for the use of Christians who assembled to worship in Woodbury. Record indicate there were about 200 who met at the time. While the Woodbury Church of Christ has constructed a new 900-seat auditorium, the old auditorium has continued to be used for Bible classes and Vacation Bible School. In the early 1960s, the auditorium was updated, but as the years have passed, needed another updating. 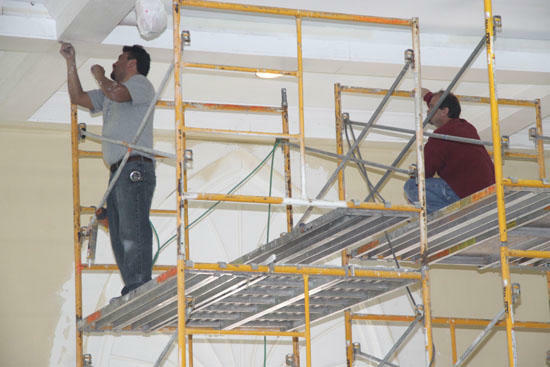 Recently plans were set in place to renovate the old auditorium. A new ceiling, new flooring, updating lighting and new painting will bring the "old" back to life. Why is it that everything old must be made new again. The oldness of the auditorium was what made it unique. Structural there was nothing wrong so why spend 50 or 60 grand or more just to make it look like new. Could have fed a lot of starving children somewhere in the world but everything must look like new or it is of no use. Sorry, killed off the "old" not brought it to life.